I have had this book in my TBR pile since it came out but something always made me pick up something else instead. Once I started it though I was kicking myself for waiting so long. Seriously this was such a unique and interesting story. The book is about two college friends, Eli and Victor, who, through scientific experiments, become EOs, ExtraOrdinaries. The story unravels what happened in college and then what happens ten years later. The story flips not only between "now" and "then" but also different POVs from all our characters. I loved the book for a variety of reasons. First the writing is extraordinary. I was captivated and enthralled by the voice of the characters. 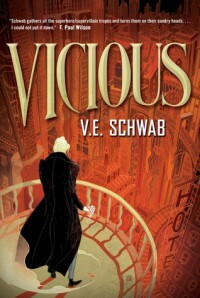 Ms. Schwab did a nice job of unraveling the story and telling it in a way that drew me in and kept me entertained. It was very addictive. I also loved the characters. First you need to know this is NOT a book about superheroes but rather anti-heroes. Each character has a part of good in them but unfortunately they also have a rather large bad part in them too. I loved the flawed characters. This book is not about bad vs. good. It is about bad vs. worse. I loved every character. The good, the bad and the ugly of each one of them! This was such a unique and captivating book. I highly suggest this book to anyone despite what genre you normally read. Throughout the whole book all I could think about was, "wow this is a great book." Pick it up today!